Take your game to the next level with improved speed, agility and quickness. Our program will focus on sport specific speed based on your goals as an athlete. Through sport specific drills targeting the plyometric (quick-twitch) system of the body, our speed and agility training aims to improve athletic speed and performance. Other benefits of our program include injury prevention, improved body control, and flexibility. All of our programs are personalized to the athlete’s ability and goals and designed by performance specialists, certified athletic trainers and licensed physical therapists. All Bon Secours In Motion sports performance programs include pre and post-testing to show objective improvement. All programs are custom-made and designed by a performance specialist with advanced training in sports performance. 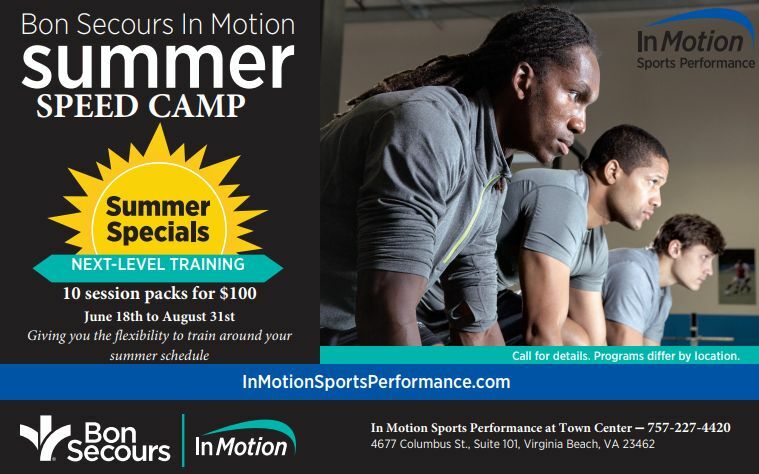 If you are interested in our speed and agility training programs available at our In Motion locations in Hampton Roads, please contact us at (757) IM-SPORT (757-467-7678) for rates and availability.